Discover the best mobile Casinos and play your favorite games on your mobile device! Are you reading this article on your mobile device? Most of our readers are. And no wonder. Half of the internet traffic worldwide comes from our smartphones and tablets. And then more than 64 percent of smartphone users who have some game apps on their phone. Considering you’re on PokerNews Casino page, I’ll assume you have some, too. Poker or Slots app? Mobile Blackjack? Or you prefer your games only via a mobile browser? 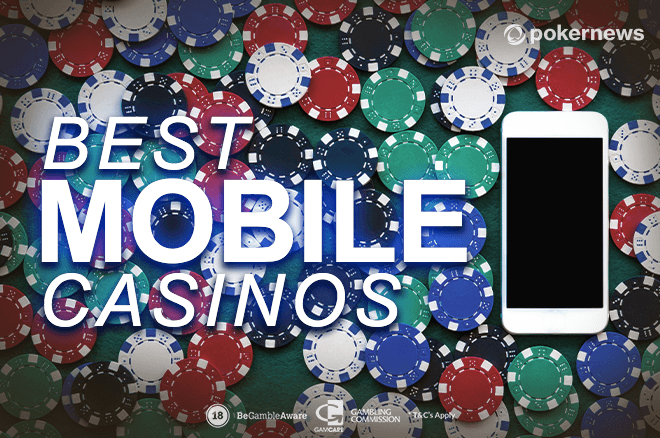 Whatever it is, you can get your dose of mobile gaming with the best mobile Casinos in 2019. The best of the best are on this list. And hey, you’re already here, so why not give them a few seconds of your attention. Any of the mentioned Casinos got your attention? You will find a short description of their mobile site as well as iOS and Android apps below. Mr Green is the gentleman of Casino gaming. He has a state-of-art gaming site available through mobile browsers. Plus, two award-winning mobile apps for iOS and Android. Mobile Casino: Most of the games at Mr Green Casino are compatible for playing via browsers. You can play games both for free and for real money. As long as you don’t have a snail-slow internet connection, the loading is fast. The quality of the games is as good as playing any other way. iOS app: Mr Green iOS app features more than 300 Casino games, including Slots, Live Casino, and table and card games. You can download the app to your iPhone, iPad, and iPod touch. It requires iOS 11.0 or later. 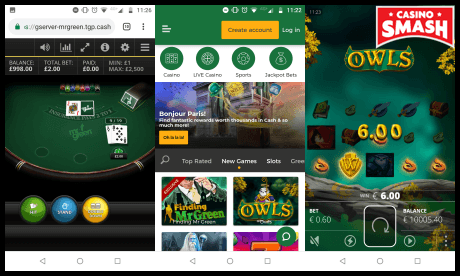 Android app: If you play on an Android device, you can get Mr Green Casino app, too. It’s not available at the Google Play Store but you can download it here. It requires Android 4.1 or later version and features the best Mr Green Casino games. 300+ of them. Welcome bonus: 100 percent deposit match up to £100 and 200 bonus spins. Casino.com is one of the best online Casinos in general. No surprise they are also the best when it comes to mobile Casinos, too. The smooth mobile version and smartphone apps make sure of that. Mobile Casino: You can register, deposit, and play games all while using a mobile browser of choice. Most of the Casino games, including Slots, table games, and Live dealer games are available to play after logging in. Sadly, free play is not available otherwise. iOS app: Not only Casino.com has an iOS app, it’s also one of the highest rated Casino apps on the App Store. 4.9 stars out of 5, even with some people smashing the app for their bad luck losses. Casino.com iOS app is available for iPhone, iPad, and iPod Touch, as long as your device runs iOS 9.0 or later. 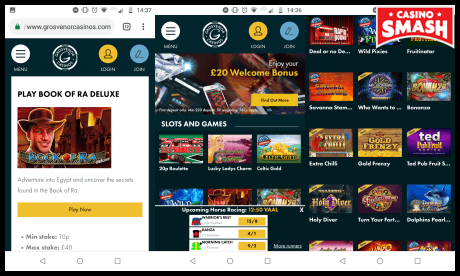 Android app: Casino.com offers all their perks to Android users, too. a chance to win the most kickass jackpots while playing on your smartphone. Make sure your mobile device has Android 4.4 or later version. If it doesn’t, it’s high time you upgraded your system. Welcome bonus: 20 free spins on sign-up, 180 free spins and 100 percent bonus up to £400 on deposit. Mobile Casino: JackpotCity Casino doesn’t have mobile apps yet. But their mobile Casino runs just fine and offers games other Casino apps could only dream of. Best and latest Video Slots. The biggest progressive jackpot games. Roulette, many variants of Blackjack and Video Poker - you name it. You can access them all instantly - no download is necessary. Also, you can play both for free and for real money which is a luxury that not every mobile Casino offers. Many payment options available, too. So, you won’t have any trouble with deposits and withdrawals. Unless you prefer slow withdrawals. Then you’ll get your winnings from JackpotCity way too fast.. Welcome bonus: 100 percent match bonus up to $400 on first four deposits. If I had to guess where you play at already, 888casino would be in my first five guesses for sure. It’s a legendary Casino gaming site that’s operating for more than two decades now. And it’s not planning to stop. Mobile Casino: 888casino works well on any mobile device you may use. You can access it via browser or a mobile app. The games will be available to you even before sign-up. You can play in a demo mode or log in and play for real money. The software at Casino is provided by the leading developers. Thus, 888casino games load fast, don’t freeze in the middle of the play, and the quality is as good as playing on a gaming computer. iOS app: Live games, 100+ Slots, Blackjack, Baccarat, and Roulette games. In other words, anything a Casino player can need from an app - that’s what you get if you download the 888casino app. To do so, you only need iOS 8.0 or later and 14.3Mb free space on your device. 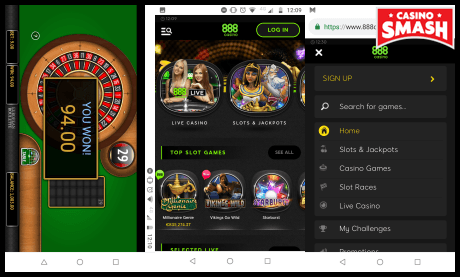 Android app: 888casino Android app is one of the highest rated Casino apps at Google Play Store. It offers more than 200 top games. Including their exclusive Live Casino tables and unique jackpot games. It’s all available to you if you have Android 4.4W or later version and at least 5.3Mb of space in your phone to download the app. Wunderino is a sky-blue and cartoon-like online Casino site. Magical mobile Casino, as they call it. While I don’t agree with the ‘magical’ part (not a believer in magic, sorry), it does offer the best gambling games to all their current and new players. Offerings also include mobile apps for iPhone and Android. Plus, a fast and smooth mobile Casino interface. Mobile Casino: Hundreds of games, many active promotions, free play, and fast loading. 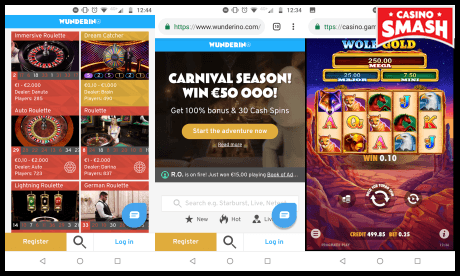 Wunderino Casino is as mobile-friendly as a Casino could be. iOS app: Whether you play on your iPhone, iPad, or iPod touch, you only need iOS 9.0 to download Wunderino app. It’s available in many languages, including English, Finnish, German, Japanese, Norwegian, and Swedish. You’ll be able to play more than 1000 Slot games and other Casino classics on your mobile device. Android app: Wunderino app for Android users is only available for download from their website. You won’t find it on Google Play, so don’t bother looking. It’s more modest than the iOS app, offering 250 Slot games. But Live Casino games, Roulette, Blackjack, and Baccarat are also present. Plus, withdrawals and deposits are secure as ever. You can even protect your gaming account with Touch ID or Face ID log in. Welcome bonus: 100 percent deposit match bonus up to €100 and 30 wager-free spins on deposit. Betfair Casino is the ultimate treat for players who enjoy the table and card games. Both in online and Live game form. But don’t get confused - Betfair Casino also features fun Slot games. You can access them from your mobile browser and iOS or Android app. 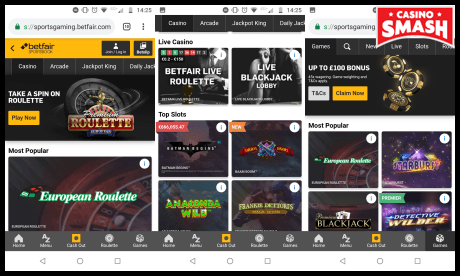 Mobile Casino: I have no complaints about Betfair mobile Casino site. It’s intuitive, easy-to-use, loads and works smoothly, and offers free play before you sign-up or make a deposit. The games are available right away, no download is necessary. You get all the perks you would when playing on a desktop pc. iOS app: Betfair Has two Casino apps. One for the players all around the world and one dedicated to users who live in New Jersey (US). Apps need iOS 9.0 or later versions to function on your device. That’s out of the way? 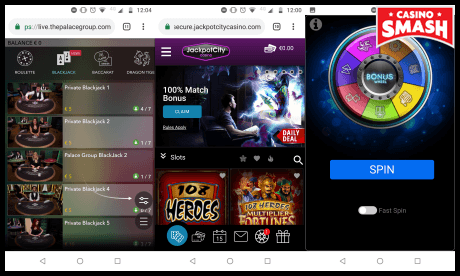 Then you’ll have a fast-loading and high-quality video Slots, Blackjack, Roulette, Live Casino, and other games on your mobile. Android app: Betfair Android app features many great games. Some you can find via browser, too. But if you have an app, you'll find some exclusive games designed for smartphones and tablets. Though, you'll need Android 4.4 or later version. Deposits are easy and secure, plus, they won’t take longer than five minutes. All that - one download away. Exclusive games, secure and fast payments, non-stop customer support. If PartyCasino is best at something, it’s one (or three) of those things. Another thing they’re excellent at is mobile Casino platforms. 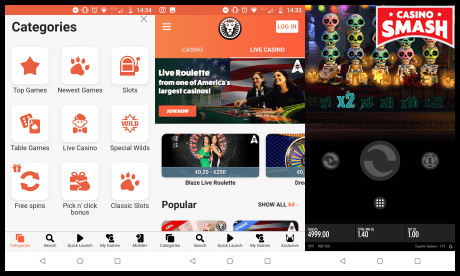 Starting with mobile Casino site and ending with two beautiful mobile Casino apps. 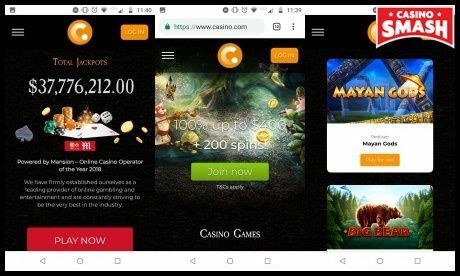 Mobile Casino: While free play is, sadly, not available, you can sign up, claim a huge welcome bonus, and enjoy PartyCasino games via your browser. iOS app: Upgrade your system to iOS 9.0 or later because PartyCasino iPhone app is a must-have for any gambler. It offers an interface in more than 20 languages (including English, Spanish, German, and French, to name a few). The app also features a great game selection. Including latest Slot games, Blackjack, Roulette, Baccarat, and more. 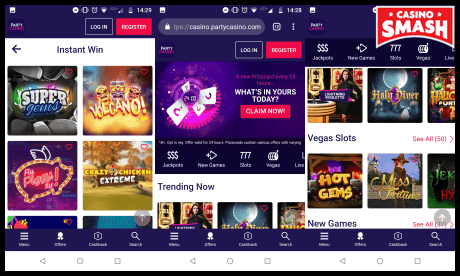 Android app: If your device runs Android instead, you can download PartyCasino app and enjoy all the same perks, too. You’ll only need Android 4.0.3 and 8Mb of memory on your device. And every bit of that memory is worth it, PartyCasino is an exceptional Casino app to have. Mobile Casino: bgo Casino is a great choice if you like Slots, Slots bonuses, and Slots tournaments. Also Bingo games and/or other Casino games. It offers the best of all kinds. Old but classic games, latest titles from the leading developers? You got it. Best of all, you can have it all on your mobile device. Access through the browser or download an app - amazing Casino experience guaranteed. 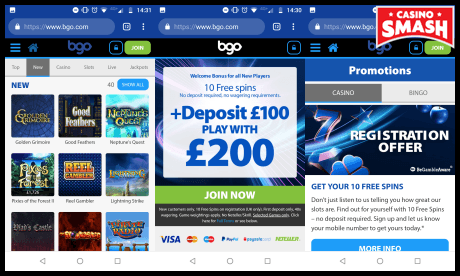 iOS app: bgo iOS app is compatible with iPhones, iPads, and iPods that run 9.0 version of the operating system or later. The app is available in English and Swedish. You can access and play bgo Slots, Bingo, and table games. Also, don’t forget to take part in the tournaments and giveaways! Android app: You can download bgo Android app this instant if you have Android 4.2 or later version. It includes all their mobile games, ongoing promotions, and rewards in the Vault. What’s the Vault? Sign-up at bgo Casino to find. Grosvenor Casinos name is probably known to everyone who lives in the United Kingdom. 50+ physical Casinos do help to make your name famous. But to make it as a synonym to great gambling experience takes a lot of work. But Grosvenor Casinos got that nailed down, too. Nowadays, you can also get digital Grosvenor Casinos experience. You can play their best games from your desktop computer, mobile browser, or app. Mobile Casino: The easiest way to access Grosvenor Casinos is through your mobile browser. Mobile-friendly Casino games will be available. Including Book of Ra Deluxe and Lucky Lady’s Charm among other popular names. You’ll need to sign up if you want to access free play and real money games. iOS app: When it comes to apps, you’ll have two options: to download the Grosvenor Casino app or Live Casino app. If you have a type of games you prefer, that’s going to be an easy choice. BTW, if you’re only an occasional Live Casino player, you can find some live dealer tables in the Casino app, too. Grosvenor Casino app needs at least iOS 10.0 while the Live Casino app needs iOS 9.0 to run. Android app: the same choice again. Do you want all Casino games, including Slots and table games, or only Live Casino games? Make that choice and download the app that fits you. The Android version necessary differs based on your device type. Welcome bonus: 100 percent deposit match bonus up to £20. enough games to keep you occupied during the dullest moments of your day. Mobile Casino: LeoVegas is an example of a perfect mobile Casino site. It feels like playing from an app rather than opening a mobile version of some site. And let’s be honest, most mobile sites lack that. Especially when it comes to gaming sites. There is a free play available, so you can play your favorite games even before you sign up or deposit. But I’d advise doing those steps anyway since there are neat bonuses waiting on each. iOS app: If the mobile Casino is an example of perfection, LeoVegas Casino app will exceed your expectations completely. It won the award of Best Native App already in 2017 and constantly keeps improving. 4.8-star rating on the Appstore shows that mobile users appreciate it, too. Have a mobile device with OS 8.0 or later? Then you can download the app already! Android app: You’ll need Android 5.0 to download LeoVegas Casino with all its glory. It includes 1000 Slot machines, jackpot games, Blackjack, Roulette, Baccarat, and more. Also, unlike the iOS app, LeoVegas Android application has both Casino and betting included in the same app. In case you’ll want to expand your gaming horizons.